copycat aardvark express teriyaki bowls. if you've been skiing or snowboarding or spent any time at snoqualmie pass in washington, you're probably hip to the aardvark express and its incredible eats. the hurry curry and teriyaki bowls are legendary in my eyes. aprés ski lodge food can be snoozeville & cafeteria-esque, so when i discovered the aardvark and all these fun fresh things to eat, i was pleased. this tiny little lincoln log shack at the mountain pass serves up some super tasty to-go dishes and always allows for a funny/weird/cozy/local/interesting experience. dan is such a character; every time i've been in there, it is a good time - even if you have to wait an unreasonable amount of time, or no time at all! haha. each aardvark experience is unique. dan also tops his hurry curry and teriyaki bowls with a square of this delicious pineapple cake, which i always end up eating first since its in the way of me eating my lunch, but then badly want it back by the end of the bowl. he makes everything himself and hanging out in there is literally like being inside his home kitchen. he always tops my bowl with some sort of thick chili paste when he sees me going for the sriracha. he's right...whatever that stuff is is better. these bowls are so satisfying and feel pretty healthy and refreshing after a day on the mountain, or just passing through town! 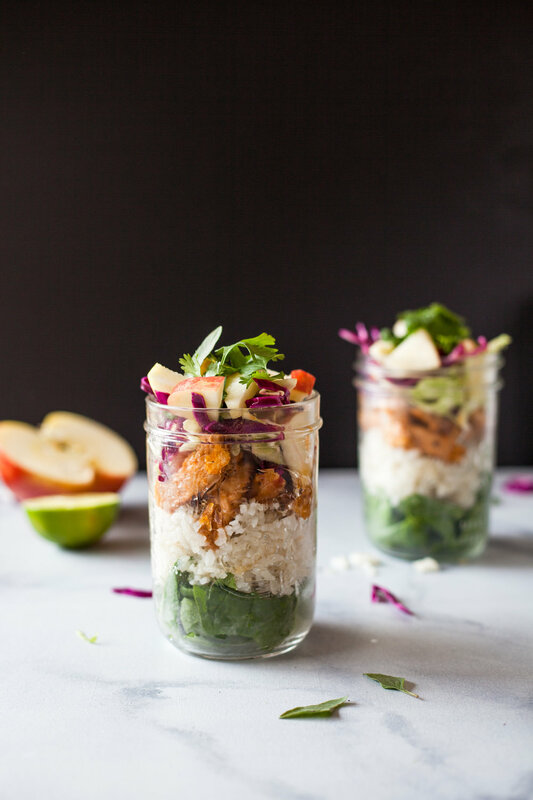 they've got a bed of spinach and thai basil on the bottom, some fluffy coconut rice, spicy ginger chicken with a flavorful teriyaki + ginger gravy, topped with crisp cold briney cabbage, freshly sliced fuji apple and tons of cilantro. my copycat version of the aardvark express' teriyaki bowls are pretty dang good if i do say so myself, but nothing beats dan's menu and the quirky execution of his dishes. i want to try everything he has to offer, but i always default to the teri bowl! In a large pan or skillet, heat 1 TB olive oil on medium heat and spread 1 cup of white rice into the skillet to lightly toast the rice. Add one can of coconut milk plus 2 ounces of water and heat to boiling. Once boiling/bubbling, cover pan with a lid and reduce heat to low/simmer. Cook rice for 20-30 minutes until liquid is absorbed and fluff with a fork. Toss the shredded purple and green cabbage in a small bowl with a splash of white vinegar, salt & pepper. Chill in the fridge while the rice and chicken cook. Filet and slice the chicken breast into strips/bite sizes. Add to a pan with 1 TB olive oil on medium heat. Lightly salt and pepper the chicken on each side. Add soy sauce and Sriracha and toss/cook on medium/low heat until a sort of gravy forms, about 3 minutes. Add the flavor pastes (garlic, ginger, and lemongrass) and toss. Continue heating until chicken is cooked through. To serve, add fresh spinach and Thai basil to the bottom of a bowl. Add a scoop of coconut rice, ginger chicken, & a bit of the chicken gravy. 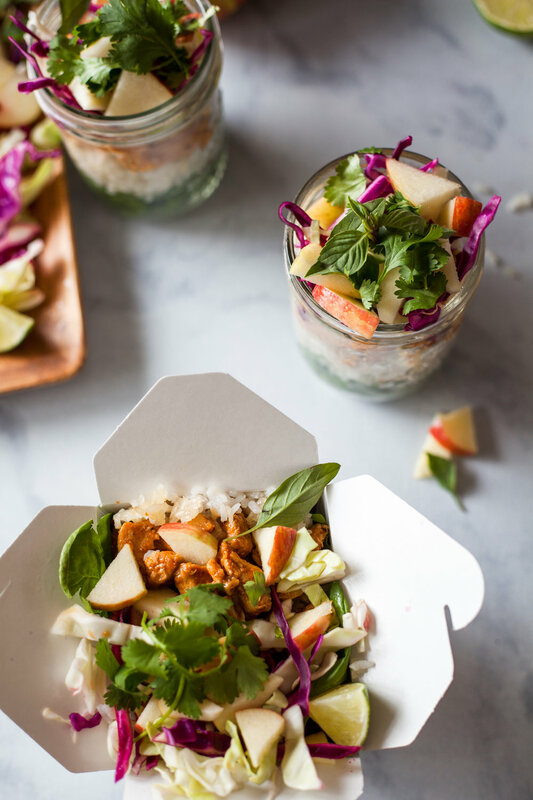 Top with the crisp cabbage, chopped apple, a squeeze of lime, cilantro and more Thai basil. Serve immediately! 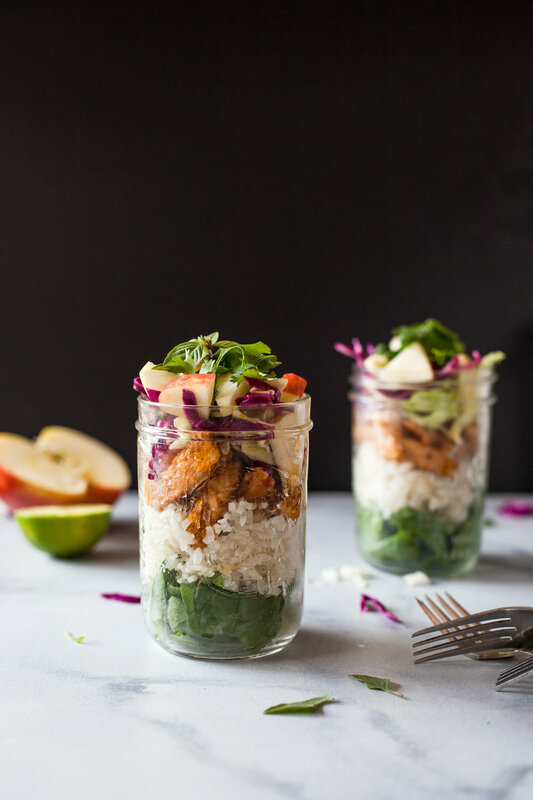 You can prep these into jars as seen in the photos and top with freshly chopped apple and cilantro/lime to liven it up when it's time to eat!